Zlatan Ibrahimovic’s second-half goal was enough to give Manchester United a crucial Europa League victory over Zorya Luhansk on Thursday evening. 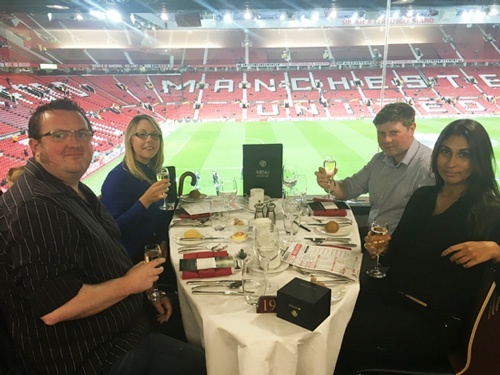 With Crystal Ball securing a corporate membership at Manchester United's Executive Club for the 16/17 season, this provided a unique spectator experience for our highly valued customers at the Manchester Utd v Zorya Luhansk game. With champagne and canapes on arrival followed by a 4 course a la carte menu and unlimited beverages, Crystal Ball's Marketing Manager; Tara Singh invited customer's Abigail Welsh (Werfen Ltd), Phil Roberts (RBF Services Ltd) and Chris Bennett (Millgate Computer Systems Ltd) to sit back and enjoy the game. A brilliant evening was had by all with great food and company, drinks flowing and Manchester Utd claiming a 1-0 victory, although not quite the win we all hoped for based on bets! We look forward to inviting and treating more customers at Man Utd with the next home game being Manchester Utd vs Stoke City, October 2nd.